Maybe you are already like Jessica Park! Kindness Question #1 What ways are you kind to yourself? Do these apply to you? Kindness Question #2 What are three kind things that you have done? List five more activities that you can do at home to display kindness, like give people compliments for their efforts, good intentions, hard work, and originality; help do household chores without being asked; thank people for their support of you. List five more activities that you can do in your community to display kindness. As a class come up with 5 activities that you can do as class to to display kindness around the school. Once you’ve completed the task please write it below. How did it make you feel to complete this project. What would happen if the world was more kind? The diggers found Jessica’s locket while digging after the flood. You can print out the image below and write your message of kindness. 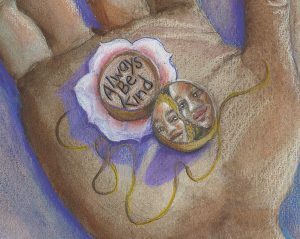 Who will you draw in your locket that helps you be kind? 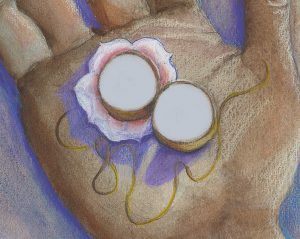 Kindness Activity #5 Hoʻoponopono (ho–o-pono-pono) is a Hawaiian practice of reconciliation and forgiveness. We bring these words when we have caused harm to others, which we all do. “I’m sorry. Please forgive me. Thank you. I love you.” These words will set you free when you need to make something right. It’s hardest to be kind when someone has hurt your feelings. That’s when we want to hurt someone back. Instead of lashing out in anger, Jayden opened his heart and his tears caused a beautiful flower to grow. Write about a time that you wanted to lash out in anger, but instead kept your heart open and something beautiful grew out of your heartbreak. Please put it on our blog. Invite Friends over, plus someone you don’t know very well, and share a yummy treat. 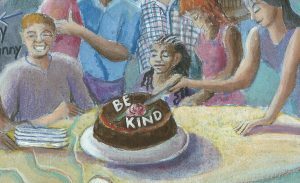 You can make up your own kind of “BE KIND” cake. Melt 4 oz unsweetened Herseys Bakers chocolate and 1 stick butter. Add 1/3 cup milk, 1 teaspoon vanilla and a pinch of salt. Stir in a box of powdered sugar (or as much of it as you can.) Then ice the cake. Our tears water our inner garden. A rose grew in Jayden’s inner garden. What grows in your Inner Garden? 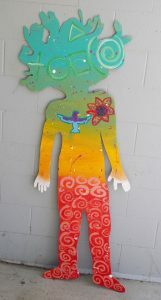 Make a drawing and upload it on our website on our blog. Send a message to a survivor of 9/11, Hurricane Katrina, Hurricane Sandy, the Flint water crisis or some other trauma. You can share support for what they have gone through with a message of understanding and care.